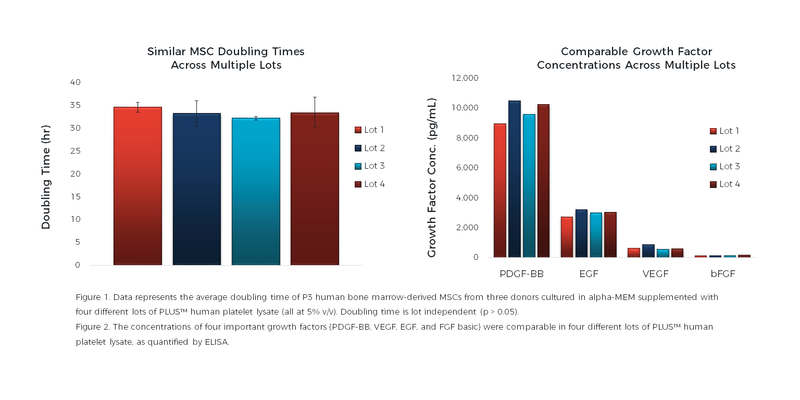 PLUS™ Cell Culture Supplement is a commercially manufactured human platelet lysate that serves as a cytokine rich replacement for fetal bovine serum (FBS). PLUS™ is prepared from platelets sourced from FDA-registered blood banks using state of the art manufacturing techniques and provides a safe, serology-tested product with minimal lot-to-lot variation. 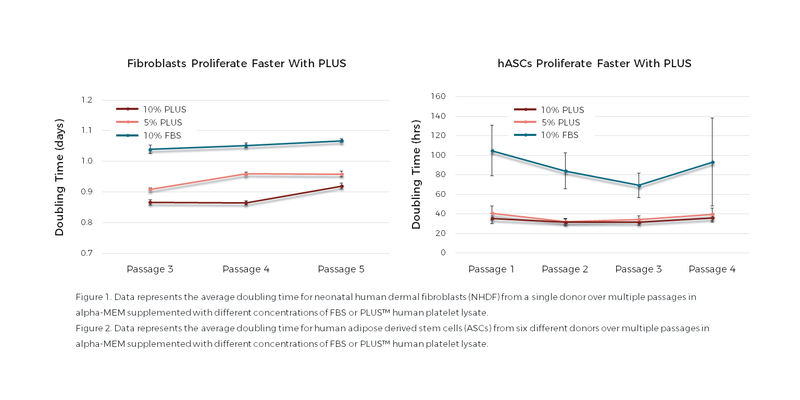 PLUS™ offers a true xenogenic-free culture platform that does not require addition of animal-derived anticoagulants (e.g., heparin). 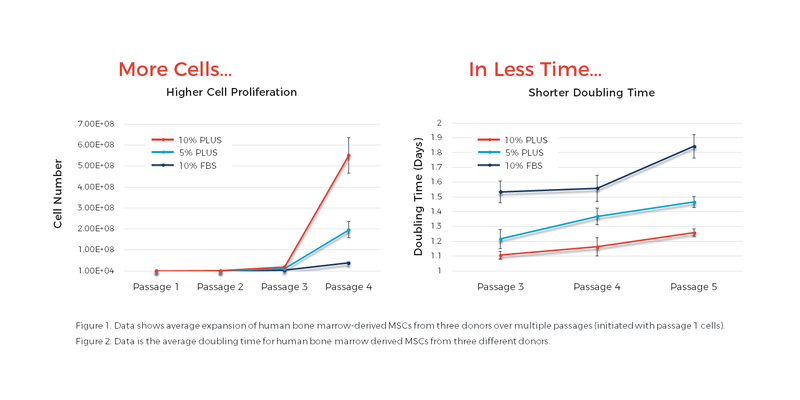 PLUS™ supports the culture of various human cell types, including mesenchymal stromal cells (MSCs), adipose derived stem cells (ASCs), dendritic cells, dermal fibroblasts, epidermal keratinocytes, and endothelial cells, and has been tested in both traditional culture systems and advanced bioreactor systems. PLUS™ is available as research grade in bottles and as GMP grade in bags. Improved proliferation without loss of phenotype for numerous cell types such as mesenchymal stem cells (MSCs), adipose derived stem cells (ASCs), dendritic cells, fibroblasts, keratinocytes, natural killer cells, etc. Availability in Cryobags - GMP PLUS™ is available in cryobags making it the only GMP grade hPL that is available in bags. Since product filling in bags is achieved using a fully “closed-loop” process, GMP product in bags are considered a safer and preferred option for use in clinical protocols compared to GMP product in bottles. Product Testing and Release Criteria - In addition to the standard testing of donor material for infectious diseases and final product testing for bacterial and fungal contamination, mycoplasma and endotoxin levels, each lot is tested for cell growth and expansion of MSCs as part of quality control prior to lot release. Drug Master File - A Drug Master File (DMF) for GMP PLUS™ is on record with the US FDA to support our US customer’s submissions to the FDA. A DMF is a submission to the FDA that contains confidential information on a product’s raw materials, manufacturing, processing and packaging. The availability of DMF for PLUS™ as an ancillary material reduces the regulatory burden on clients significantly. PLUS™ customers may make a request to Compass Biomedical to reference the DMF in their submission. ​Regulatory Support for Clinical Trials - If you would like to have a more detailed technical discussion about adopting GMP PLUS™ into your cell therapy protocol, please contact info@compassbiomed.com. We are happy to work with you and provide the documentation needed to advance your research and development efforts. PLUS™ GMP Grade Gamma Irradiated Human Platelet Lysate (PLUS™-GR) has been developed to meet the pathogen reduction requirements of the 9th Edition of the European Pharmacopeia Monograph (General Chapter 5.2.12). PLUS™-GR has been gamma irradiated at 25-40 kGy for safe elimination of potential pathogens without compromising efficacy. The product is manufactured and gamma irradiated under cGMP for use in clinical cell culture protocols. PLUS™-GR is available in cryo-bags. Research grade PLUS™ is manufactured using the same high quality raw materials and a similar production process. The performance of research grade PLUS™ closely matches that of GMP grade PLUS™, and thus enables a seamless transition from early research and development applications to those requiring extensive, GMP-level documentation. Research grade PLUS™ is available in bottles. In addition to standard testing of donor material for infectious diseases and final product testing for bacterial and fungal contamination, mycoplasma and endotoxin levels, each lot is tested for cell growth and expansion of MSCs as part of quality control prior to lot release. To order or learn more about Compass Biomedical's PLUS™ Human Platelet Lysate, please feel free to contact our Customer Service at 855-hPL-PLUS (855-475-7587) or sales@compassbiomed.com.